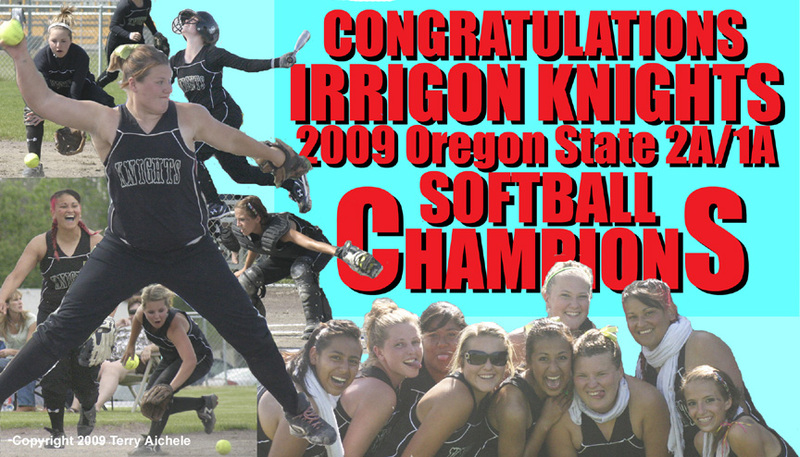 The Irrigon Knights won the OSAA state 2A/1A softball championship on Friday, June 5, 2009 at Oregon State University in Corvallis. It is the first state final and championship for Irrigon since the new high school opened in 2004. Irrigon students had been attending Riverside High School in Boardman between 1968 and 2004. Prior to 1968 Irrigon had a high school at another location in the town with a different mascot. CORVALLIS - The Irrigon Knights defeated the Union Lady Cats by a score of 1-0 to win the OSAA state chamionship on June 5, 2009 at the Oregon State University softball field in Corvallis, Oregon. Jessica Henrichs of the Knights scored from third base in the top of the first inning on a ground out by Noelle Write. That was the only score either team came up with on a wet, drizzly day in Corvallis. Irrigon went to bat first in the top of the first inning. Lead off batter Jessica Henrichs walked. Making her way around the bases until she was sitting on third when the Knight's starting pitcher Noelle Wright grounded out allowing Henrichs to score from third base. The Union Lady Cats went three up and three down in the bottom of the first. Irrigon catcher Staci Stanger made it on base in the top of the second. She was able to steal second base but was left there. Union got a runner on base with a walk in the bottom of the second. Irrigon catcher Staci Stanger picked the Union off on an attempted steal at second base. The third inning was three and three down for both teams. Irrigon pitcher Noelle Wright struckout the Union batters in order. The Knights went down with a strikeout, a fly out and a ground out. Irrigon was able to put runners on base in the top of the fourth. Kim Campos hit to leftfield. Then Leslie Coffman laid down a bunt and was safe at first on an error. So with Campos on third and Coffman at second and only one out things looked good for the Knights. But Jessie Reynolds, the Union pitcher, bared down and struck out the next two batters leaving Campos and Coffman stranded. Union was able to get a runner on first but nothing came of it as three batters flewout. Jessica Henrich hit a basehit up the middle with two out in the top of the fifth inning. Henrich was unable to advance on a groundout by the next batter. Union was able to get a runner on base with a hit to rightfield in the bottom of the fifth. The next batter hit to secondbase which forced out the lead runner. Then Stanger threw out the runner at first on a pickoff. Leslie Coffman was able to get on base in the top of the sixth on a hit to leftfield. Coffman was stranded. Union Lady Cats went three up and three down in the bottom of the sixth. With Irrigon hanging on by only a run the Knights may have felt some pressure to put some runs on the board in the top of the seventh. That didn't happen as the Knights went down on two strikeouts and a groundout. Union knew they had to do something in the bottom of the seventh. The leadoff batter hit to centerfield. The next batter got on base. So with batters on first and second and one out the pressure was on the Knight's Wright to take control. A wild pitch advanced the two runners to second and third. Then Wright took control and struck out the batter. With two out and runners on second and third Wright knuckled down and struckout the final batter of the game giving the Knights the 1-0 win. History was made on that wet afternoon as the win was the first state championship in any sport since Irrigon High School reopenned in 2004. The team did an excellent job. The players, coaches, staff and citizens of Irrigon should feel proud of the hard work the team performed to win the championship.